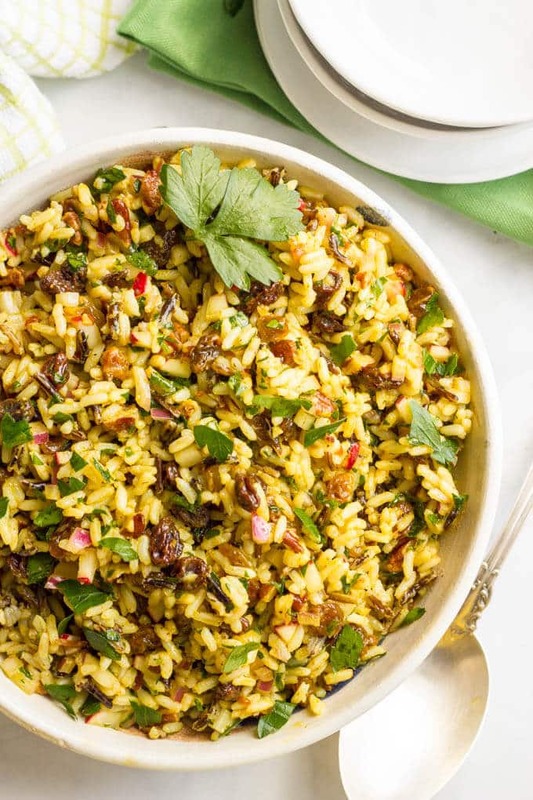 This cold curried wild rice salad with raisins and pecans has amazing flavors and textures and is perfect as a make-ahead dinner side dish or lunch. You’ll be addicted! This post has been sponsored by Uncle Ben’s. All thoughts and opinions are my own. How was your Valentine’s Day? Did you celebrate with your sweetie? Stay in or go out? Ignore the “holiday” all together? My husband and I are pretty low-key but we did get to have a night out to go see a play and it was a fun treat. We saw The Curious Incident of the Dog in the Night-time and I was amazed by the staging, set and choreography. It’s a strange but powerful story, and they really did a great job with it. And now, I’ve gotta share with you my latest obsession. One of my favorite local restaurants here in Charlotte has a cold wild rice salad that, once I ordered it, has become the only thing I ever order there. It’s meant as a side but when we go, that’s what I get for lunch. I made just a few changes to their recipe. I reduced the amount of olive oil and sugar, substituted white wine vinegar for champagne vinegar and used raisins instead of currants (cause that’s what I have on hand). 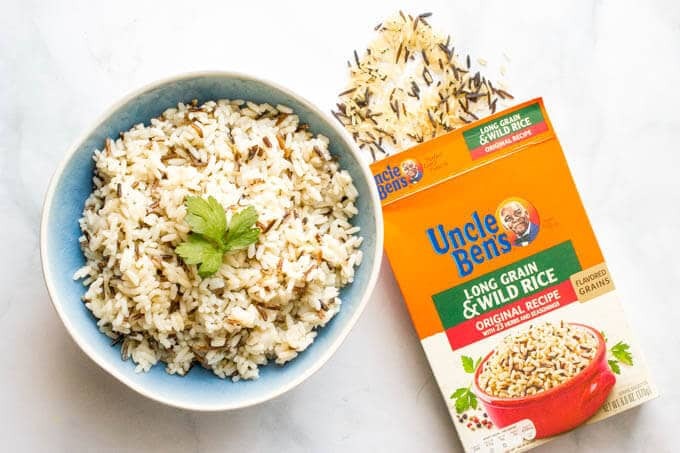 You can pick up your Uncle Ben’s rice at Target (aka my home away from home) and BONUS — You can get 10% off all Uncle Ben’s Products with this Cartwheel offer. The offer runs Feb. 12 through March 11, so grab your Target list (I’ve got a running one in the back of my planner) and go get some! You can substitute walnuts for pecans if you prefer. 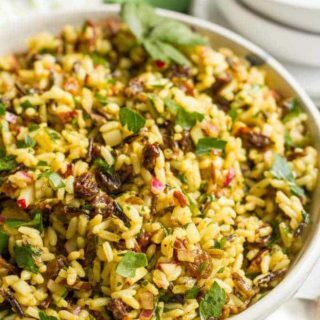 I like the parsley in this salad, and it’s what the restaurant uses, but I could also see substituting chopped fresh cilantro here too. Make sure your raisins aren’t clumped together when you add them so that you can stir them in well. 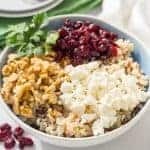 I always have the original Uncle Ben’s Original Long Grain and Wild Rice on hand, but you could substitute their quick-cooking wild rice if you prefer. 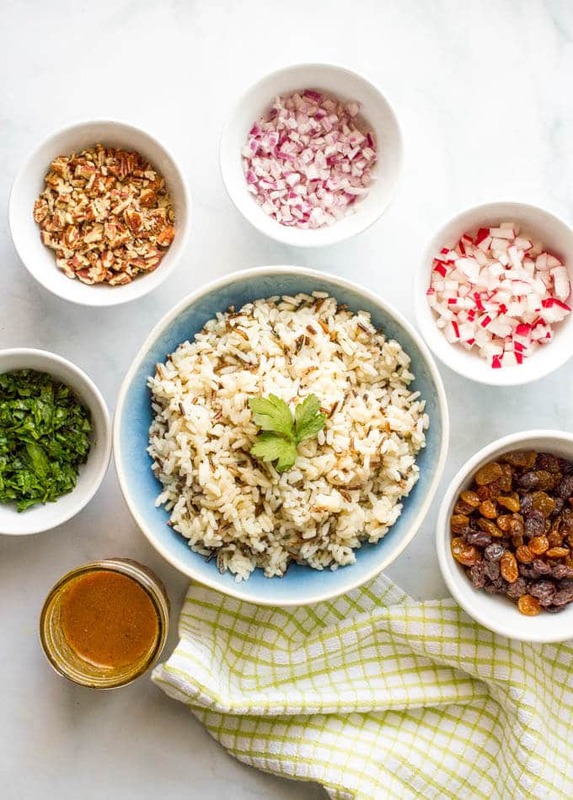 Tip: Prep all of your ingredients and the vinaigrette while the rice is cooking so everything is ready to go. This can be made ahead up to a day before. I actually prefer it chilled after it’s had a chance to let the flavors marry. The salad keeps well in the fridge, completely dressed, for 2-3 days. After that, some of the ingredients lose a little bit of their crunch. However, you could make the salad and the vinaigrette and store them separately, then combine the day of. 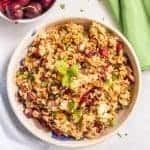 This curried wild rice salad with raisins makes a fabulous side at dinner with some grilled or baked chicken or pork — might I suggest my Parmesan chicken — along with a side salad for a complete, healthy dinner! And I love that I can prep it ahead earlier in the day or the day before and have one less thing to worry about on a busy night. 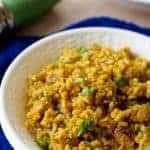 It’s also great as a make-ahead lunch for the week. 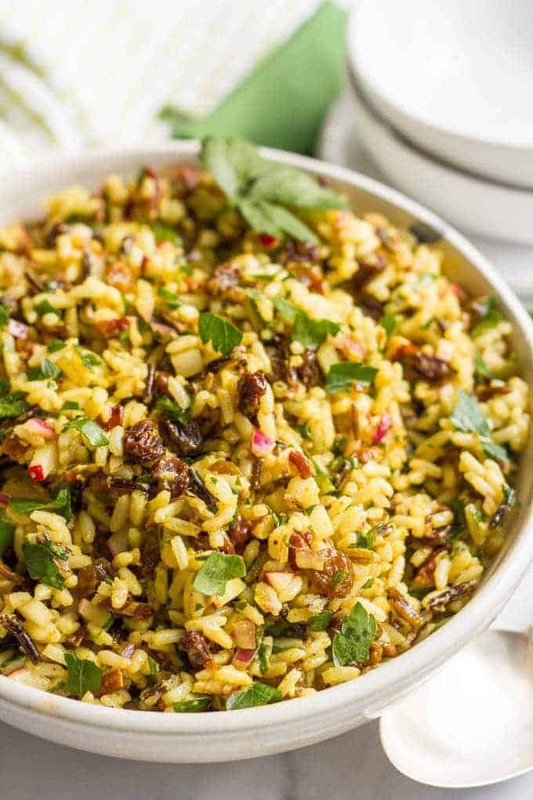 It travels well and you’ll be the envy of the office with this to chow down on! I hope you give this a try and I hope you have a wonderful weekend! 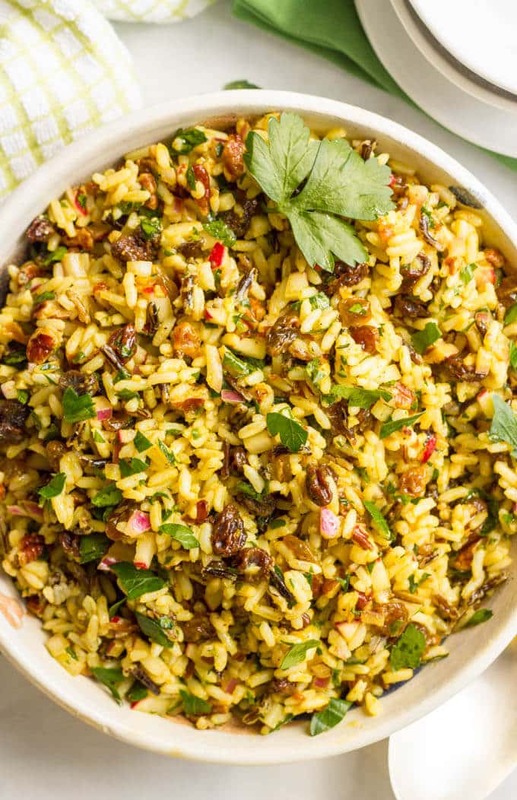 Cold curried wild rice salad with raisins and pecans is an addictive and easy side dish! 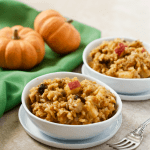 Cook rice according to package directions, omitting the butter and seasonings. 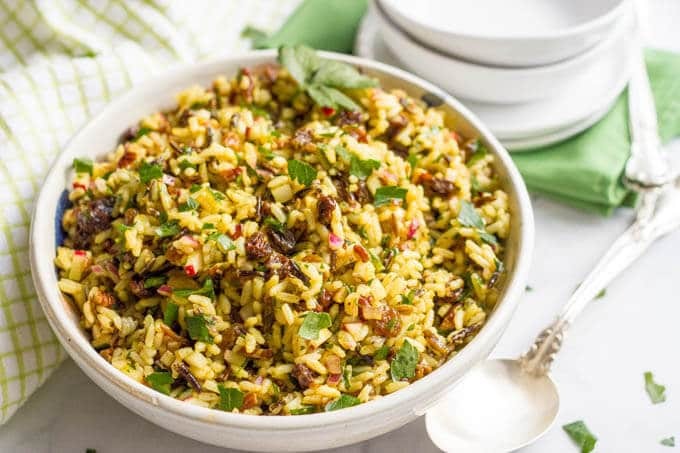 Once rice is cooked, rinse under cold water, drain well and place in a medium bowl. 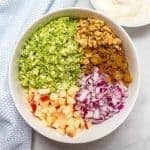 Add remaining salad ingredients to bowl and stir to combine. To make the vinaigrette, combine all of the ingredients in a small jar or a container with a tight fitting lid. Cover and shake vigorously for 30-45 seconds, until well mixed and the sugar is dissolved. Serve or chill until ready to serve. 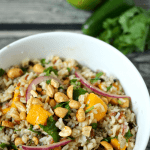 oh, rice salads – I love them so much, and this is definitely going in to my collection! Happy post-Valentine’s Day! The ingredients are missing from the recipe.